The information defined at the VM Template building time is presented to the VM using the VMware VMCI channel. This information comes encoded in base64 and can be gathered using the VMware Tools. VMware tools are needed in the guestOS to enable several features (contextualization and networking feedback). Please install VMware Tools (for Windows) or Open Virtual Machine Tools (for *nix) in the guestOS. In order to make your VMs aware of OpenNebula, you must install the official packages. Packages for both Linux and Windows exist that can collect this data and configure the supported parameters. 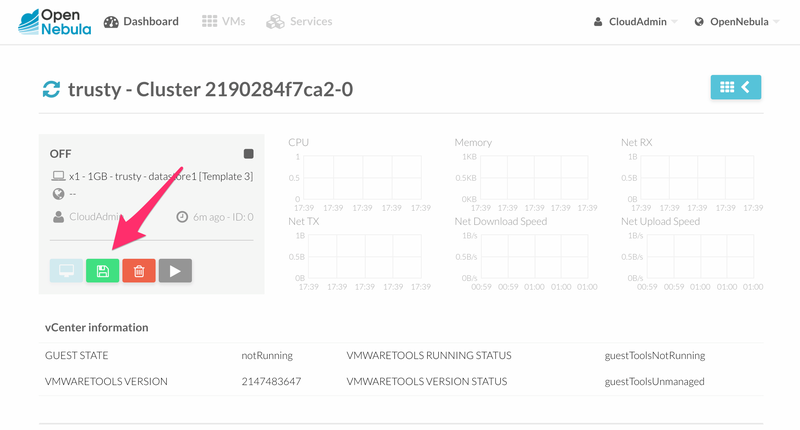 If you already happen to have a VM or Template in vCenter with the installed OS you can start it and prepare it to be used with vOneCloud. Alternatively you can start an installation process with the OS media. Open the Local Group Policy Dialog by running gpedit.msc. Go to Computer Configuration -> Windows Settings -> Scripts -> startup (right click). Browse to the startup.vbs file and enable it as a startup script. open-vm-tools are installed as a dependency of contextualization package. In vCenter open the VM menu, go to “Guest OS” section, click in “Install VMware Tools...” and follow the instructions. Alternatively use the instantiate as persistent functionality for this step, that will create the new VM Template as soon as you terminate the VM.